Our collaboration sausage is mojo based. Mojo is a vibrant sauce made the juice and zest of oranges, citrus, garlic, chili, cumin and many other spices. I am a big fan of bright flavors and mojo was once of those sauces that stuck with me from the time I learned it right after culinary school. 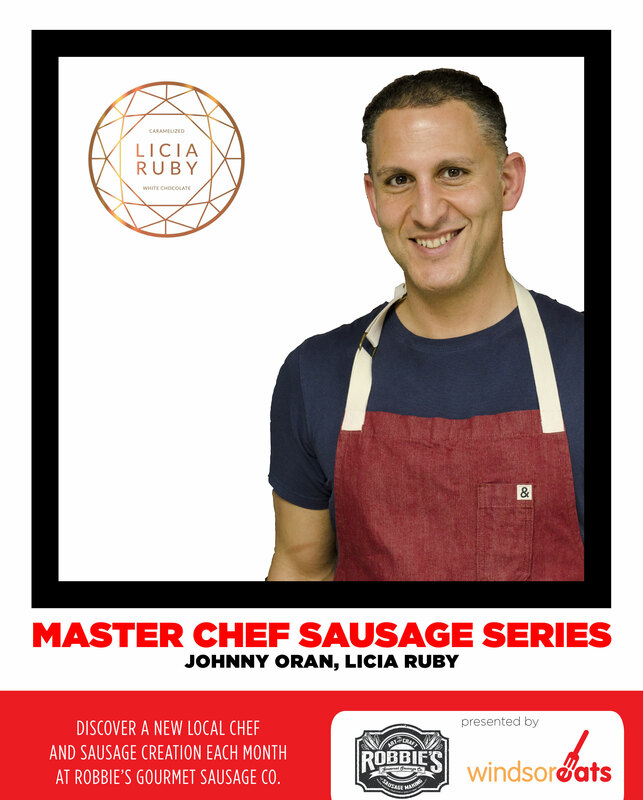 Owner/Chef of Licia Ruby. A small batch chocolate business, specializing in one product: A premium caramelized white chocolate bar. Roasted white chocolate bars featured in Chatelaine magazine. While working as the pastry chef at Splendido Restaurant in Toronto I got to work with an upcoming chef named Patrick Kriss, now Chef/Owner of Alo Restaurant in Toronto. He was the executive chef at the time but not really well know. He was the most creative, hard working and humbled chef I have met. Patrick was a master at modern cuisine. But there was always plenty on a dish with a balance of texture, aromas and taste such as salty, sour, bitter. To This day when I create a dish or a menu I think of what I learned from him about balance and technique and try to apply it. Robbie is always looking for big flavors in these collaborations. Being a big fan of mojo sauce made the decision an easy starting point. Once we had the base down, we started taste testing. Both Robbie and I after every test would think of another way to bring the sausage up a level, to where we finally both loved it. Also wanted to use flavors that would work well with The Dinner on a Pier this upcoming summer, as this sausage will play into a dish. Favorite spice by far is the kimchi furikake rice seasoning. I try not to have it in the house too often as I can consume a bottle in a couple days. I’m offering up a recipe for guacamole and pickled red onions that work perfectly with the Mojo sausage.